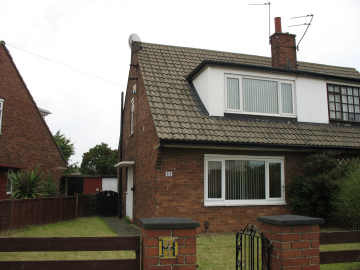 A 3 bed semi detached property - currently tenanted at £475PCM. Intruder alarm. Central heating thermostat. Smoke detector. TV point. Fire surround with marble hearth incorporating a 'living flame' gas fire. Blinds. Telephone point. NTL point. Good display of base and wall unit. Wall mounted combi boiler. Laminate flooring. Indesit gas cooker. Partially tiled. Cupboard with shelving the electric and gas meter. Walk-in storage cupboard. Door leading to rear garden. Cream corner bath. Cream pedestal wash basin and toilet. Shower off the taps. Half tiled. Laminate flooring. Two cabinets. Single radiator. Blinds. Access into insulated loft. Smoke detector. Storage cupboard. Single radiator. Blinds. Display of storage cupboards. Single radiator. Blinds. Brick-built storage hut. Laid mainly to lawn. Laid mainly to lawn to the front and side.